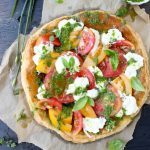 A fresh summer puff pastry pizza , made with freshly picked heirloom tomatoes, heavenly burrata and a smooth basil and garlic chives green sauce. This puff pastry pizza is dedicated to all of you dear friends who share my heirloom tomato obsession and burrata cheese addiction! Because you and I are one and the same! 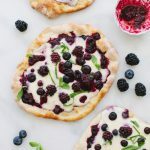 Why Puff Pastry Pizza you ask ? Summer is in full blast in California, and as much I stand 100% behind my rustic pizza dough, there is no way I’m blasting my oven to 500”F to heat the pizza stone for 1 hour. So I take a fun shortcut and use store bough puff pastry as my pizza crust. AMAZING! Because not even your favorite California food blogger can take the kitchen heat for too long this time of year. True story you guys! So thank you Puff Pastry Pizza for entering my world. Want a slice ? This is as easy as it gets too. While my puff pastry is baking, I go grab some garlic chives and fresh basil from the garden. Then I make a quick fresh sauce in my mini food processor ( great deal from Sur la Table <-that little machine is Everything by the way) to spread on top of my pizza. 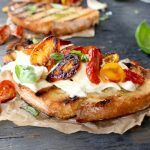 Also to drizzle over the fresh tomatoes and burrata cheese. Because we are not cooking those perfect heirloom tomatoes, and we are most definitely not cooking the burrata cheese. We talked about that when I made the crispy crust Burrata Pizza with the oven roasted tomatoes. Remember that one ? 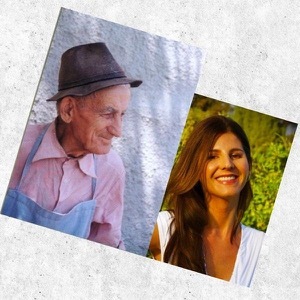 The perfect pizza I learned how to master in Sicily, the one who is my soulmate forever and ever. 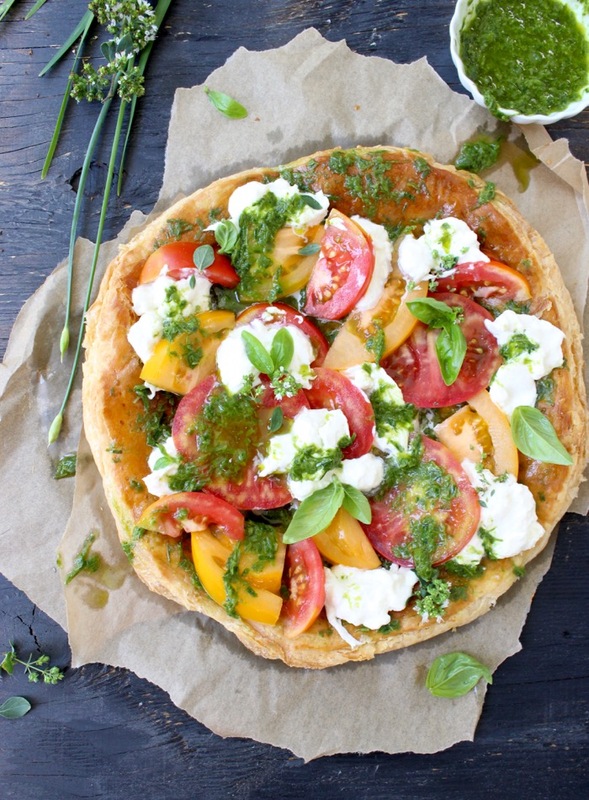 But we also need a good summer pizza, one that bursts with freshness from freshly picked herbs, tomatoes and fresh burrata. This is when the Puff Pastry Pizza saves the day ! The magic of it all comes from the perfection of the fresh ingredients you pile on top. I made a very light fresh green sauce as a base and to drizzle over top. But you can easily turn that into a fresh pesto by adding a small handful of pine nuts, walnuts or pistachios into the mix. Your call! As you might have noticed, half of my Puff Pastry Pizza has nice slices of Prosciutto di Parma! The kink of Prosciutto in the entire Planet. Because the BatMan wanted some you know ? And I’d be lying If I said i didn’t touch it. I’m only human. If you aren’t trying to be a vegetarian as myself, then Prosciutto really belongs on top of your Puff Pastry Pizza. The perfect little salty addition to the sweet fresh tomatoes and creamy burrata. And then you drizzle it all over the top with the magical green sauce, the perfect balance between fragrant fresh basil and mild garlic chives. Now, I grow both garlic and onion chives in my garden, If you can’t find the garlic ones at the market just substitute with onion chives. It will work beautifully! Whatever you decide to use as your base sauce, just make sure it is something light that compliments the freshness of the ingredients on top. I am particulate fond of the little fresh oregano leaves on top. Note worthy: make sure to allow the puff pastry pizza to cool off to room temperature before adding the sauce and the toppings. Use a flat spatula to flatten it out a little if it gets too puffed up and irregular. You know what else makes me happy? This puff pastry pizza makes fantastic leftovers. You can store it nicely in the fridge and have it for breakfast on a hot summer morning. Forget about it! 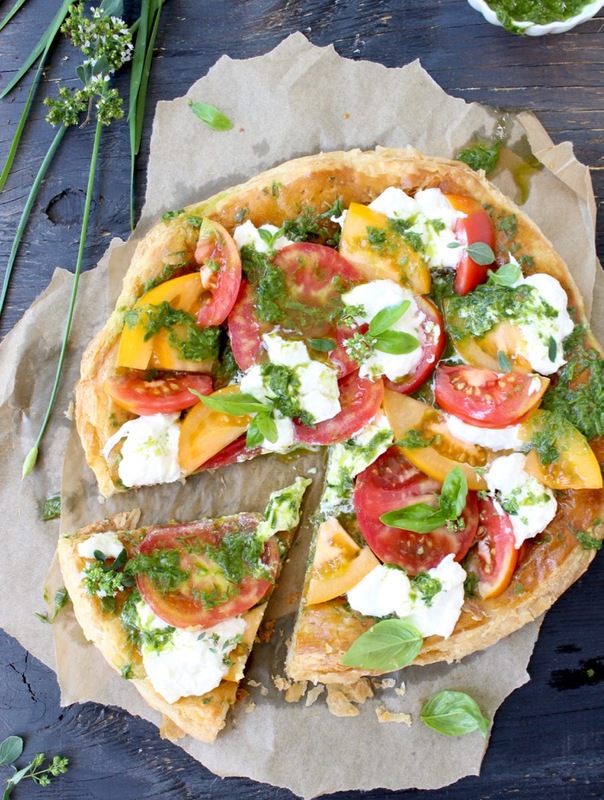 A fresh summer pizza made with puff pastry, freshly picked heirloom tomatoes, heavenly burrata and a smooth basil and garlic chives green sauce. According to the directions on the package unwrap the puff pastry and cut it into a circle. You can place a large dinner plate on top and simply cut around it. Place the puff pastry pizza round on a parchment paper lined banking sheet. Use a fork to poke holes all over the surface. Whisk the egg and water together and brush the top of the puff pastry pizza. Bake In the preheated oven for 20 minutes or until it is golden brown on top and puffed up. Remove the puff pastry pizza from the oven and allow it to cool at room temperature. Meanwhile in the bowl of a small food processor, purée together the garlic chives, basil leaves and olive oil until combined well into a green sauce, but with a little texture. Adjust the seasonings of your green sauce with sea salt and the lemon juice to your taste. Refrigerate until ready to use. Slice the tomatoes into rounds and wedges to your liking. Spoon some of the green sauce on top of the cooled off puff pastry pizza and spread it all over the top. Using your hands tear the Burrata cheese and place it in between the tomatoes. Spoon some more of the green sauce over the top of the tomatoes and Burrata and sprinkle with a good pinch of Fleur de Sel or sea salt. 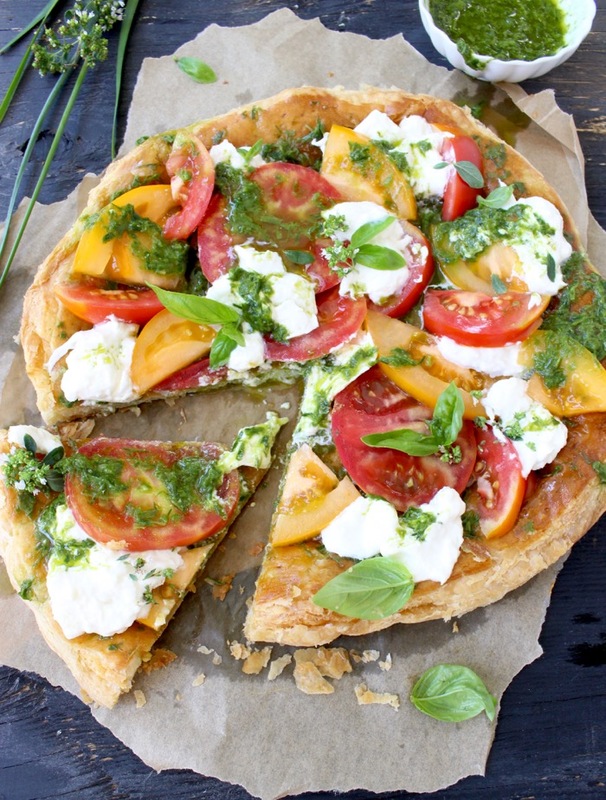 Garnish your raw pastry pizza with fresh basil leave, oregano and oregano blossoms if available. 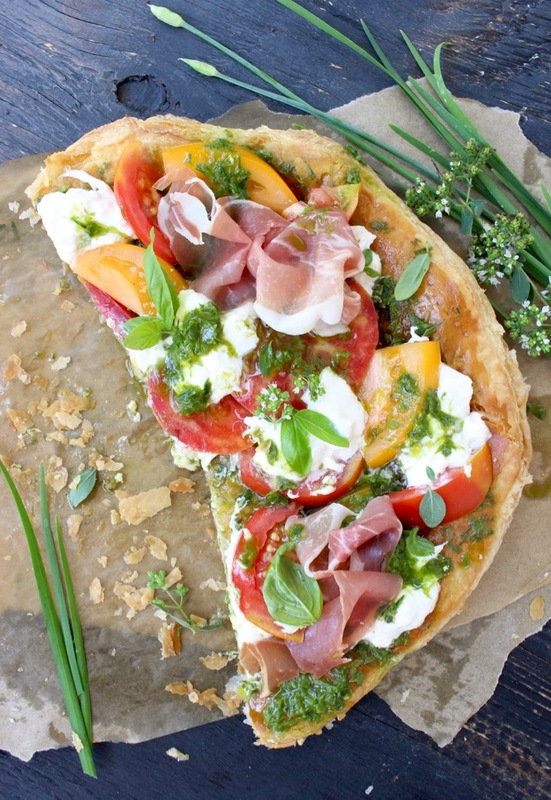 Top with the Prosciutto di Parma and enjoy!